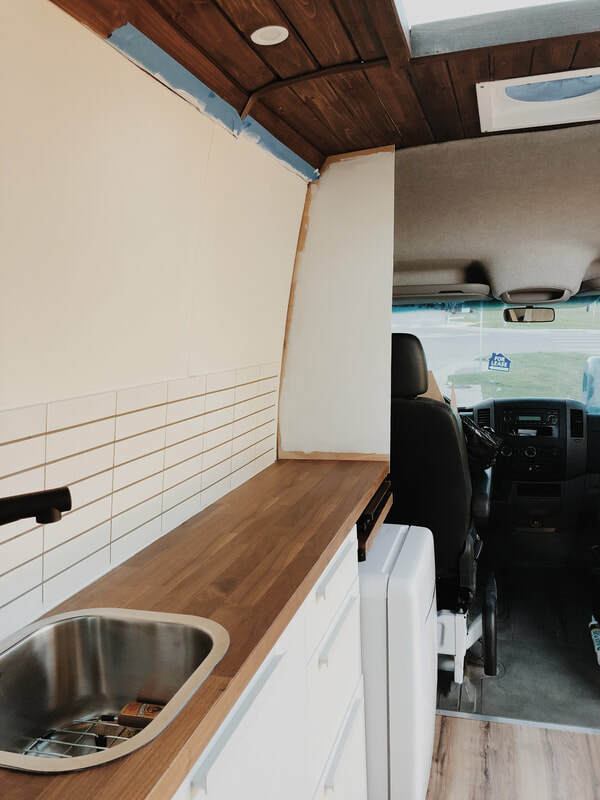 The extras were probably my favorite part of this build because I had everything else squared away and could just focus on making this van conversion more of a home. 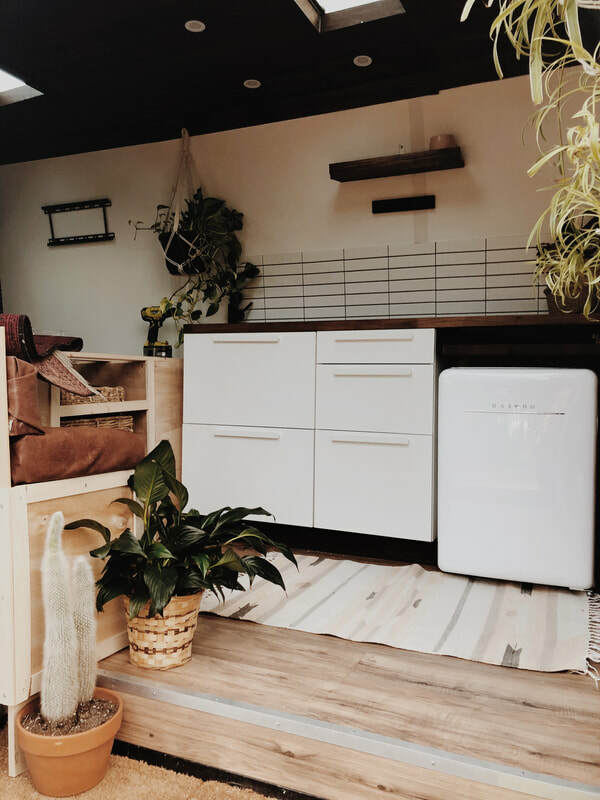 Some of these extras are functional, some just for decor, but when all combined together it really made the van less of a van and more of a studio apartment. Click on the photos to check prices for each item. It was really important to me to have a way to clean some of my clothes without always having to go to the laundromat. 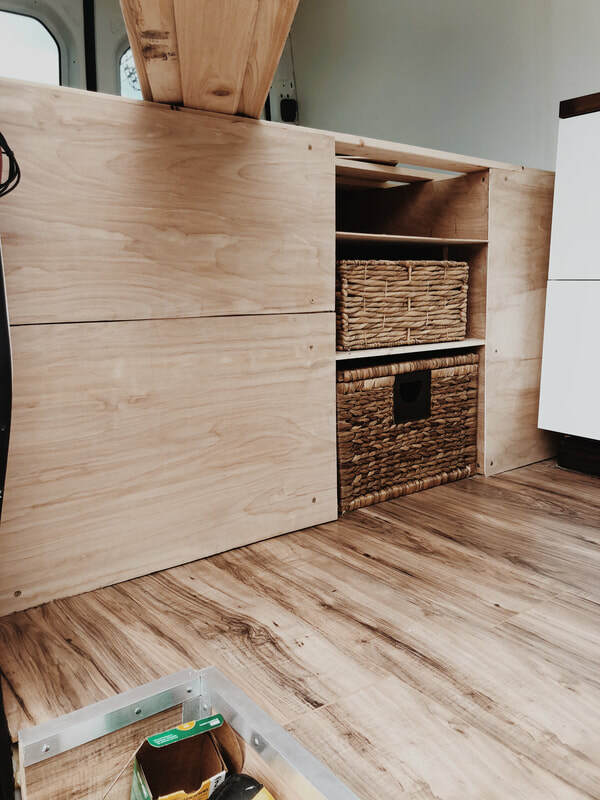 While I still will go to the laundromat when needed, the laundry pod will be a great supplement for quick washes and keeping my clothes fresh on the go. 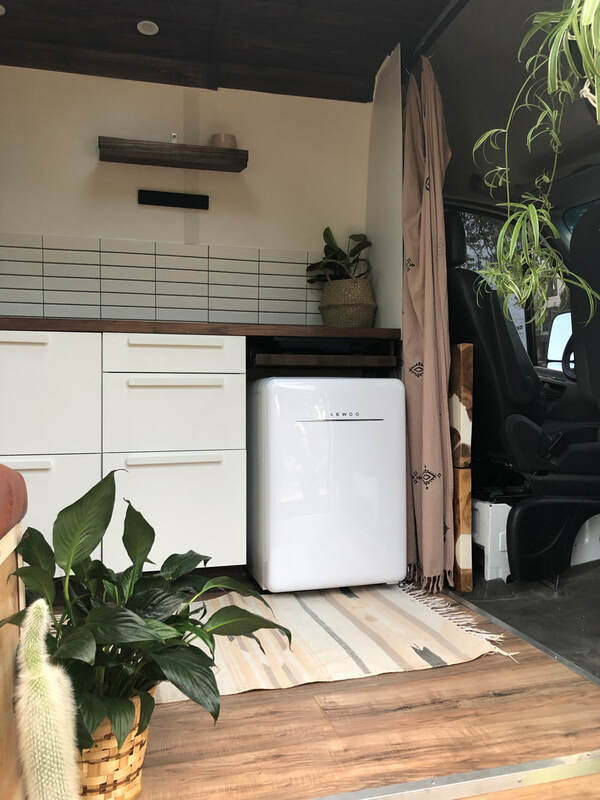 The Laundry Pod had great reviews, plus a spin dry option, which is why I chose it. I needed really large planter holders in order to house my large plants. These are SO sturdy, I made the right choice. I've only hung two for now, but I have the third in case I find another plant on the road. 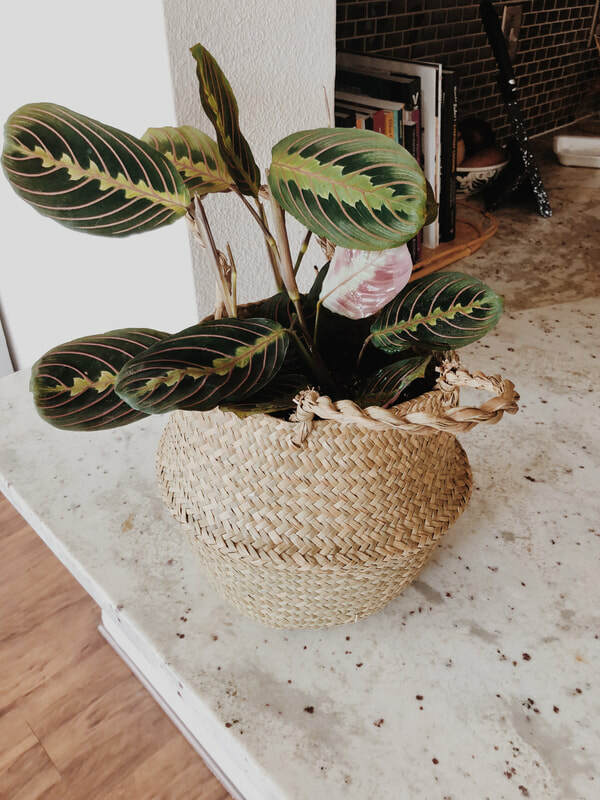 Many macrame plant holders are expensive when they're handmade, but these were relatively inexpensive for my needs. Plus they're darn pretty. I added a pedestal leg and base for my table in order to be able to set it up when I need to work or eat, but also take it down when I want the open space to move about. 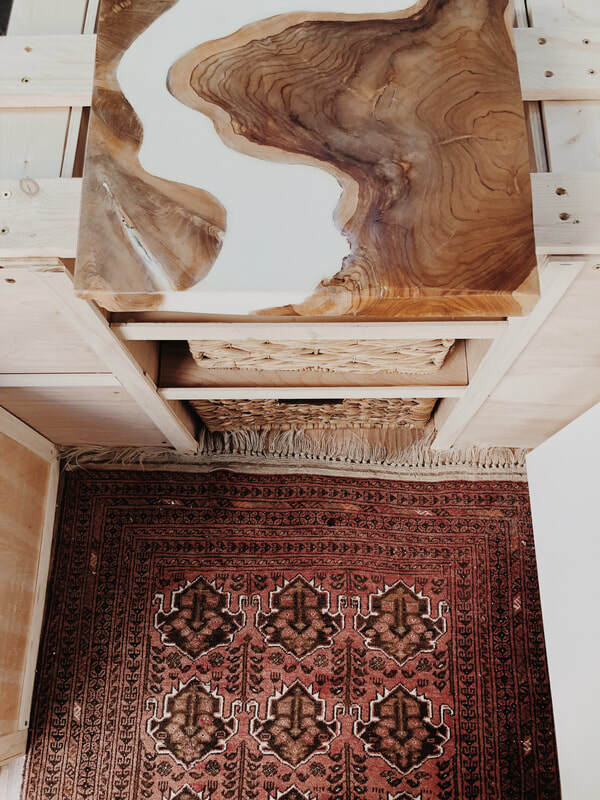 The pedestal and base are both very inexpensive and work perfectly for my needs. They also are much sturdier than I expected. This handy little gizmo sits on top of my drinking water jug and pumps water out when I want to drink. It is charged through a USB which is awesome and fits on top of most 2-5 gallon containers. We used to have a hand pump in the RV and it just got really tedious, plus it didn't work half the time. I have a 7-gallon jug for my grey tank and a 7-gallon jug for my fresh water tank. 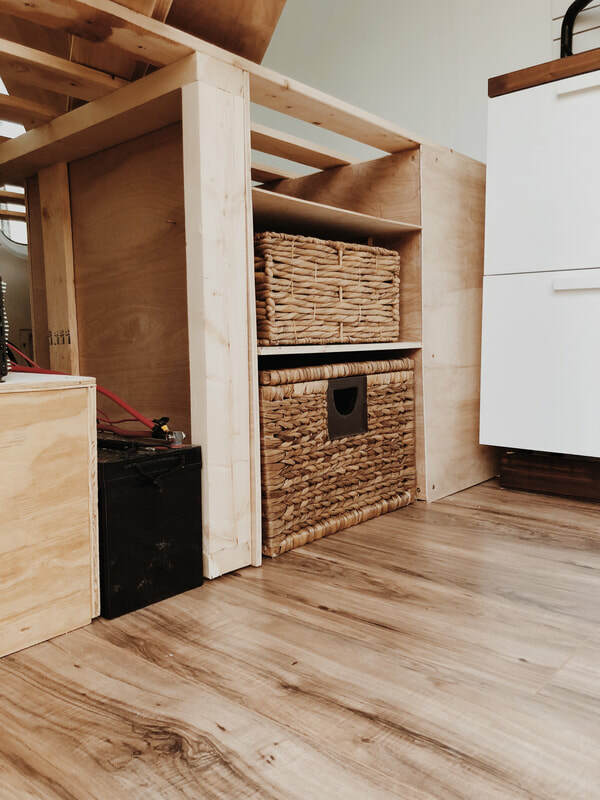 These are situated underneath my bed build and are easy to get to from the outside so that I can change them and dump them out when needed. I'm not using the fresh water tank for drinking, just washing dishes and all that fun stuff. These are very durable containers are extremely sturdy, too. It's easy to forget about important household items like a fire extinguisher and a smoke/carbon monoxide detector. 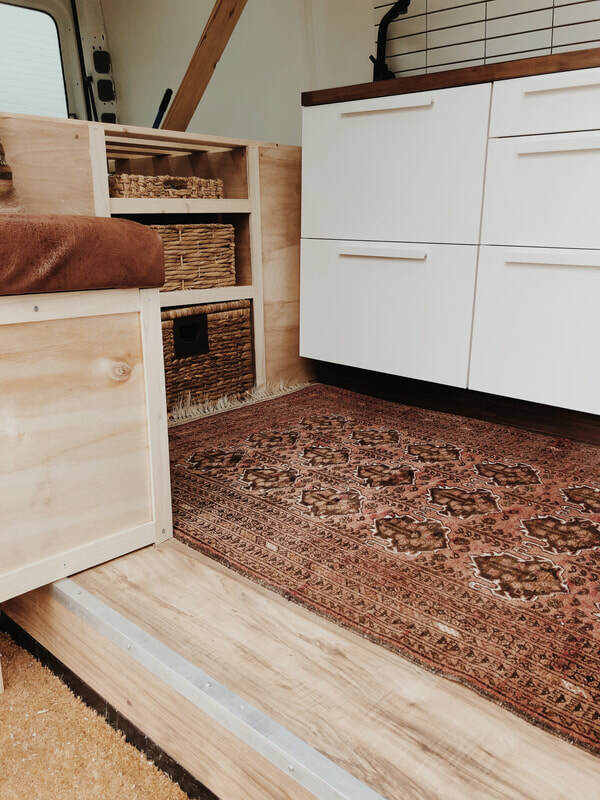 However, they are imperative when living in a van in order to prevent any unnecessary accidents from happening. Better safe than very sorry. Here's a fun fact...Lucid makes a short queen mattress. RV owners rejoice! 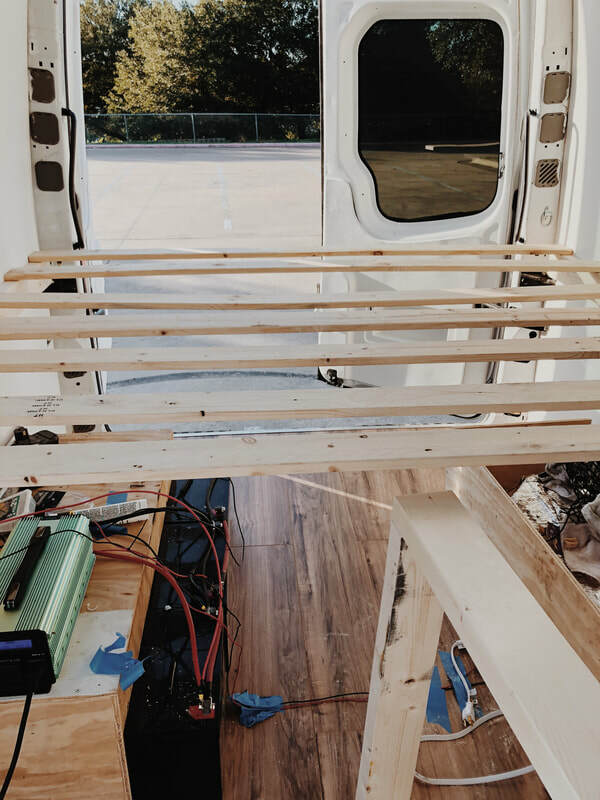 It is REALLY hard to find a quality mattress that fits the dimensions of an RV and especially of a van. I knew that I definitely wanted a queen mattress, but I just didn't need that extra length that comes with it. This queen had the width of a queen but the length of a full which is absolutely perfect. Plus, it's damn comfortable. This was probably the most fun aspect of the whole build. 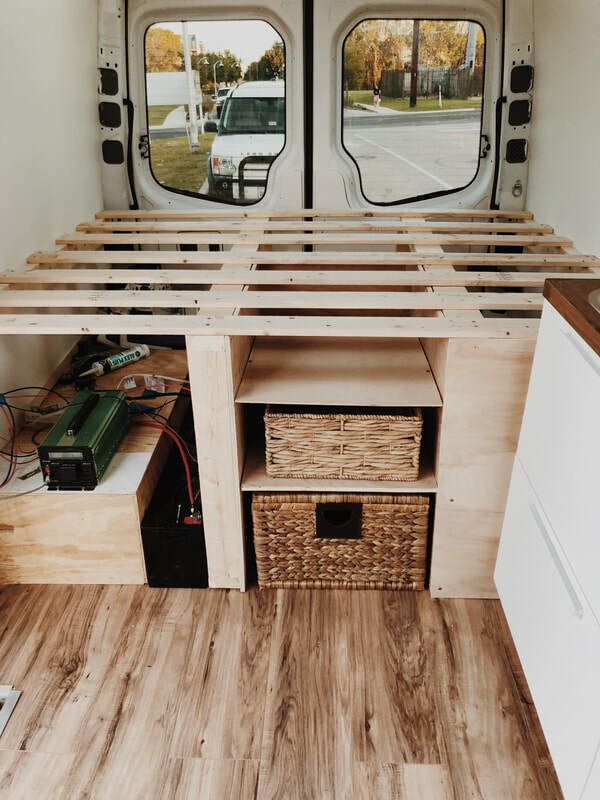 I was able to add those little components that turned the van from an automobile into a home. The plants were from our Austin apartment, and I just did not want to part with them. 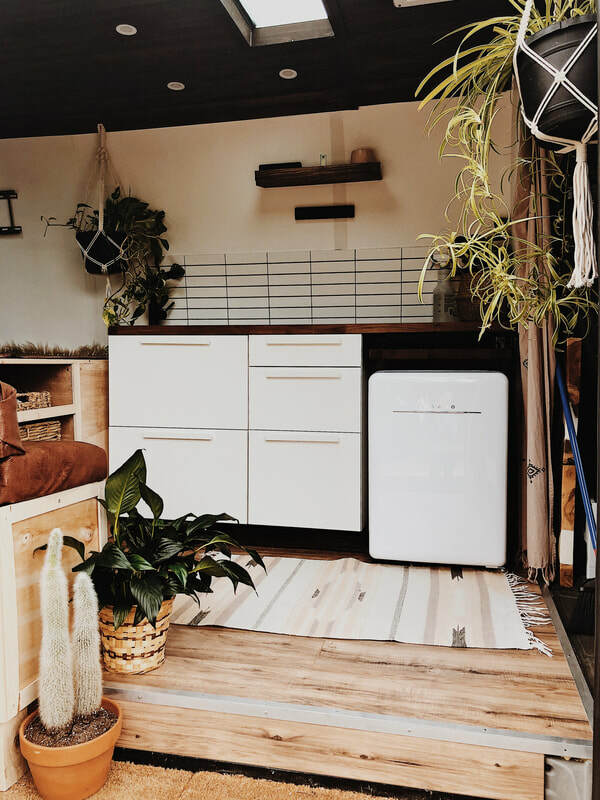 They add so much life and make the space feel more natural. I got a few baskets from TJ Maxx to keep my clothes and some more canned and dry goods, plus I found the cushion foam and faux leather fabric from Hobby Lobby. The rugs we had already within the house and I was pretty stoked that I could use them in the van. The moss wall I created from fresh moss I ordered from Etsy and wood I had leftover from the build. 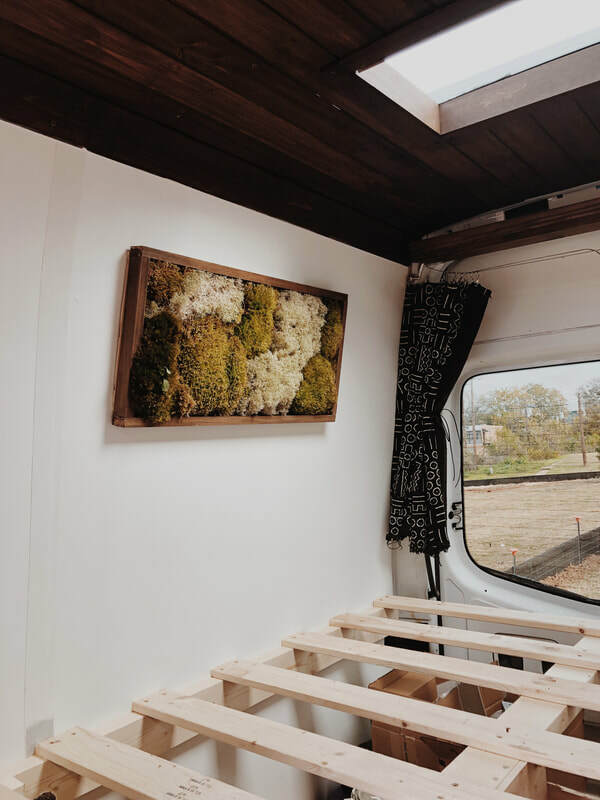 I wanted fresh moss instead of preserved in order to absorb a lot of the humidity that will form inside the van. However, be warned, live moss requires A LOT of care. I spray it daily with water to make sure it stays moist.